To Cite: Bruzzone B, De Leo P, Sticchi L, Canepa P, Rappazzo E, et al. Diagnostic and Therapeutic Implications in a Case of Mixed Hepatitis C Virus (HCV) Infection, Hepat Mon. 2017 ; 17(3):e44774. doi: 10.5812/hepatmon.44774. Introduction: Hepatitis C virus (HCV) multiple infections can influence the course of the disease, either by boosting hepatocellular injury or by increasing the frequency of exacerbations. Their prevalence ranges from 5% to 39% in individuals with HCV infection, with a higher impact on injection drug users (IDUs), or in prison settings. Case Presentation: The current paper reported a case of dual HCV infection in a 31-year-old female, with a referred vertical transmission of HCV infection and also a history of IDU, who harbored a subtype 4d since youth. Treatment failure, after a 24-week course of sofosbuvir/ledipasvir, prompted a reevaluation of present and past HCV status. HCV genotype was determined by INNO-LiPATM HCV II kit (LiPA II) (Innogenetics, Ghent, Belgium) and sequencing of NS5B region (nucleotide 8281 - 8679). Direct-acting antivirals (DAAs) resistance profile was investigated by NS3/4, NS5A and NS5B sequencing with specific primers. The Sentosa® SQ next generation sequencing (NGS) workflow was further performed in the baseline and failure samples. Unexpectedly, a subtype 4d in the pretreatment sample and a subtype 1a in the posttreatment were identified. No resistance associated mutations (RAS) were detected in the subtype 4d, although the 170AV and 174S in the NS3/4 gene, the 30R in the NS5A gene, and the 444D in the NS5B gene were detected in the subtype 1a virus from the failure sample. Conclusions: Two main hypotheses were raised: a reinfection with a new subtype 1a virus during the treatment with a wild type strain, which developed RAS after infection or with an already mutated virus; and a pretreatment hidden dual subtype 4d plus 1a infection. Mixed infections (MI) with distinct hepatitis C virus (HCV) of different genotypes are frequently reported (1-6). They are described as dual or multiple coinfections, superinfections, reinfections, or a mixture of them (1). Blackard J et al. defined coinfection as “infection with > 2 HCV heterologous HCVs simultaneously or within a very narrow period before infection with the first HCV as resulted in an immunological response to that virus”, superinfection as “infection with a second HCV after the establishment of persistent HCV infection and development of an immunological response to the first virus”, and reinfection as “primary infection that is completely cleared virologically prior to a subsequent, secondary infection with either a homologous or a heterologous HCV” (7). Their prevalence is reported from 5% to 39% in individuals with HCV infection, and considerably higher in injection drug user (IDU) cohorts, or in prison settings than in other at-risk groups such as multiple blood recipients and patients undergoing dialysis (1, 8, 9). It is suggested that MI can impact the course of the disease, either by boosting hepatocellular injury or by increasing the frequency of exacerbations (1). However, methods to detect minority populations within the circulating quasi-species are not yet of widespread use; thus, the overall prevalence of HCV MI may be underestimated (2). Although the next generation sequencing (NGS) technologies offer a more sensitive method to detect minority populations within the circulating quasi-species, allowing distinguishing coinfections and superinfections from reinfections, the latter may be overestimated by standard sequencing due to the poor sensitivity in detection of minor variants (2, 9, 10). Due to the relative genotype specificity of the new anti-HCV drugs, some concerns are voiced about the effectiveness of treatment in HCV MI, but the question is not yet addressed by guidelines, and no reports are issued on the topic. The current paper reported a 31-year-old female with a referred mother-to-child-transmitted HCV infection and also an IDU history, who had her first unsuccessful interferon course at the age of 10. At 14, HCV-RNA was 2 × 104 and genotype 4 was firstly detected. As an adult, she was followed by the infectious disease unit of San Paolo hospital (Savona, Italy) where a genotype 4 strain was repeatedly detected. After developing liver cirrhosis, confirmed by histology, in 2 occasions (2007 and 2014) she started a treatment with pegylated interferon alpha and ribavirin, which was discontinued for different reasons without the achievement of a virological response. In August 2015, after confirmation of genotype 4 infection with 2.2 × 105 HCV-RNA IU/mL, she started a new treatment with sofosbuvir/ledipasvir for 24 weeks. At the end of the treatment, HCV-RNA was undetectable for 4 weeks, but after 12 weeks it became measurable at 1.0 × 104 IU/mL. A sample was sent to the Hygiene Unit for DAAs resistance evaluation. However, attempts to sequence NS3/4, NS5A, and NS5B regions using home-made protocols and genotype 4 specific primers failed. As it was found that both the mother and husband had subtype 1a HCV infection, LiPA II and phylogenetic analysis of the NS5B region (nucleotide 8281 - 8679), were performed using a home-made protocol described elsewhere (11, 12) both on the sample collected before the DAAs treatment and on the sample collected at failure. Both methods consistently revealed a subtype 4d in the pretreatment sample and a subtype 1a (clade II) in the posttreatment one. NS3/4, NS5A, and NS5B genes were sequenced in both viruses using genotype-specific primers and conditions provided by the Chair of Virology of the Tor Vergata University of Rome, Italy (13, 14). No NS3/4, NS5A, and NS5B polymorphisms and/or RAS were detected in the subtype 4d virus obtained from the baseline sample. Conversely, 170AV and 174S in NS3/4 gene, 30R in NS5A gene, and 444D in NS5B gene were detected in the subtype 1a virus from the failure sample. The detected RAS is reported to confer resistance to simeprevir and to all NS5A inhibitors (15). The Sentosa® SQ NGS (Vela Diagnostics Germany GMBH, Hamburg, Germany) workflow (mean coverage/target > 200 × for genotyping and > 500 × for variant calling) was further performed to analyze both baseline and failure samples (16). In the baseline sample, sequence reads were mapped only to subtype 4d reference genome. In the failure sample, sequence reads were successfully mapped only to reference subtype 1a. The variant coverage rate in the NS5A gene of 30R and 30H RAS were 96.31% and 4.49%, respectively. A phylogenetic analysis of the NS5B region (nucleotide 8281 to 8679) confirmed the presence of 1a subtype in the husband. The NS3/4, NS5A, and NS5B sequencing allowed detecting only the 122G and 174S RAS in NS3/4 gene, important only for simeprevir. Finally, a phylogenetic tree was constructed using NS5A subtype 1a sequences obtained by samples collected and sequenced in the same period showed a tight cluster (pairwise distance: 0.15) of the patient’s and her husband’s viruses (Figure 1). Figure 1. 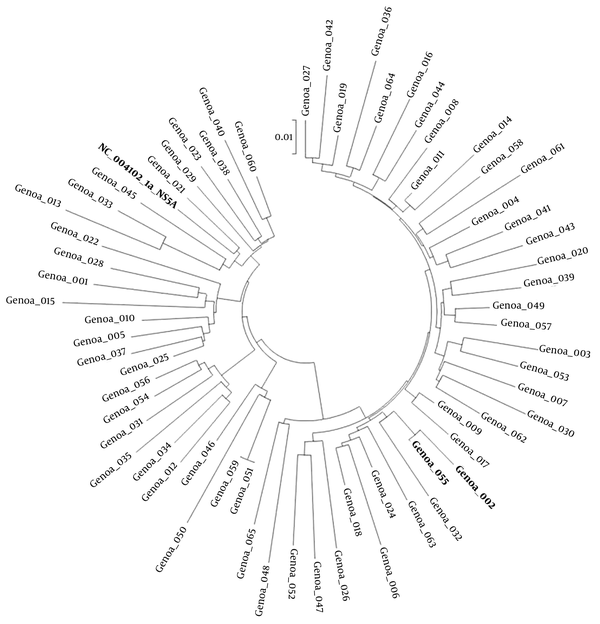 Neighbor-Joining tree showing the genetic relationship between NS5A sequences obtained from 65 HCV genotype 1a infected patients. Related cases are reported in bold. Evolutionary analyses were conducted in MEGA5. The current paper reported a case of MI by 2 distinct HCV viruses with different genotypes, not only appearing in connection with a treatment cycle, but also showing the likely correlations with the treatment failure. 1) The patient harbored a subtype 4d before starting treatment with sofosbuvir/ledipasvir. This virus was identified a wild type strain. As expected, an early virological response was obtained, concurrent with a clear clinical and biochemical benefit. 3) The subtype 4d virus kept being undetectable, while a new virus was now identified as subtype 1a. Interestingly, it was reported that both the live husband and the mother of the patient, prior to death, harbored a subtype 1a HCV chronic infection; however, the only possible source of the genotype 4 virus seems to be a vertical transmission, provided that the mother’s virus type had been wrongly identified by old tests, which often failed to sort the small genetic differences between the 2 similar strains. 4) Retesting of pretreatment samples, including NGS, failed to detect any other virus than subtype 4d. 5) The newly detected subtype 1a HCV clustered almost perfectly with the husband’s virus in a phylogenetic tree, except for the presence of several RAS in all the 3 gene sequences. Unfortunately, a patient pretreatment peripheral blood mononuclear cells (PBMC) sample was not available to investigate the presence of different genotypes in different compartments. In fact, sequences of HCV, although it is considered a hepatotropic virus, can be detected in PBMC, central nervous system and liver biopsy, as reported by several studies (17-19). Thus, differential diagnosis comprehends a reinfection with a new subtype 1a virus during the treatment period in turn either with a wild type strain which developed RAS after infection or with an already mutated virus, and a pretreatment hidden mixed subtype 4d plus 1a infection was possibly acquired during her past IDU period. In this case, the 2 viruses might have also been compartmentalized. Either hypothesis seems hardly supportable. The literature reports include frequent occurrence of superinfections in patients with an IDU history (3, 6), and reinfections in patients with late virological relapse after virological response achievement (10, 20, 21). However, a reinfection is very unlikely to occur with any virus at all during a 2-drug treatment cycle, which, in addition, was conducted well enough to lead to a systemic vascular resistance (SVR) for the subtype 4d virus. Moreover, no serious risk factors were reported in the period. Finally, unlike of sexual transmission, the husband’s virus (the seemingly only possible source of infection) did not harbor any RAS and he never took anti-HCV drugs, thus, resistance should have de novo arisen during the treatment. On the other hand, if genotyping by LiPA II testing and simple HCV standard sequencing could have missed the presence of a subtype 1a virus represented in a minority in the viral circulating quasi-species, NGS should have revealed it. Indeed, dual or MI are rarely detected by standard sequencing, because the simultaneous presence of large quantities of different viruses is usually a transient occurrence. Moreover, standard sequencing can generally detect the prevalent virus; in fact only HCV variants present at the prevalence of > 20% (9). In a short period, one strain is deemed to prevail, either for a less efficient host immunological pressure, or for an intrinsic major fitness. If, in the current case, a mixed infection was present before treatment, the subtype 1a virus should have been extremely low, not detectable by a very sensitive test such as NGS. The virus 4d must have possessed a strongly favorable fitness; therefore, only when it was knocked off by the drugs the subtype 1a virus could emerge. Therefore, both hypotheses were really supportable; as the superinfections occur frequently (3, 6), and reinfection is frequently described in several reports (10, 20, 21) in patients in whom after the virological response achievement, a late virological relapse was revealed. However, if this is the case, it remains to explain how subtype 1a virus could rapidly develop resistance, while the subtype 4d virus was easily suppressed. Possibly it harbored some still undetected RAS favoring resistance growth. Furthermore, the 2 strains might have been compartmentalized enough to be reached by the drugs with different concentrations, thus different efficacies. Another possible explanation was that the 2 events (virus 4d suppression and virus 1a resistance development) were not simultaneous. Indeed, virus 4d killing occurred early, in the first few days of treatment, when virus 1a was not yet replicating. Finally, a large part of this discussion is based upon the assumption that NGS can always detect very low levels of minority strains. After what was exposed here, should it be blindly relied upon without questioning? Is an accurate selection of primers always a sensible item for its correct use? An effort to avoid multi-genotypic primers in this kind of analyses could confer a major reliability of results. Authors thank the Chair of Virology of the Tor Vergata University of Rome, Italy, for the transfer of the laboratory protocols and the assistance provided. We would also thank Stefano Razeti for technical help and Arrow Diagnostics for providing us data by Sentosa® SQ Next Generation Sequencing. Authors’ Contribution: Pasqualina De Leo and Marco Anselmo, patient’s clinical data collection; Bianca Bruzzone , Laura Sticchi and Giancarlo Icardi, designing the report; Paola Canepa and, Emanuela Rappazzo, performing the molecular analysis; Bianca Bruzzone , writing the paper. Financial Disclosure: There was no financial disclosure to the current report. Funding/Support: There was no financial support for the current report.